The issue of bullying in teens and children has had an increase in awareness over the last few years, with countless news articles about teens or pre-teens who have been either victims or perpetrators. Statistics show that approximately 160,000 teens skip school every day due to issues of bullying. With those numbers in my head and a further awareness the bullied teens are nearly 10% more likely to consider suicide, I decided to review It Looks Like This by Rafi Mittlefehldt. It Looks Like This centers around Mike, a 15 year old boy whose parents have recently moved Mike and his little sister Toby to Virginia from Wisconsin. Mike’s father is authoritarian and religious. His mother is equally religious but quiet and almost subservient. The book opens after its ending. A short chapter shows Mike recalling a memory of a time watching the sunrise with the other main protagonist, Sean. This moment sets the stage for the second chapter which jumps back to the beginning where Mike is revealed as the narrator. Dismayed that his son is “soft”, Mike’s father pushes him towards sports and similar activities in an effort to “toughen him up.” Mike, recognizing that he is a misfit both at home and at school, tries to appease his father but has neither the talent nor the passion. After Mike is paired on a project in French class with another boy in his class, Sean, things begin to change. The two quickly strike up a close friendship and the tentative beginnings of a romantic relationship. Unfortunately, neither Mike nor Sean can escape their fathers. Nor can they get away from Victor, another boy in their class who has targeted Mike with his bullying. It Looks Like This touches on issues of homophobia, cyber-bullying, and conversion therapy. Religion is a very significant specter in Mike’s relationships with his family and friends. Several of Mike’s friends at school are also part of his church. His father’s mercurial temper is deeply intertwined with his religious convictions. His is the final word in the household, and Mike’s mother is either too afraid or too conditioned to speak out against her husband. It Looks Like This contains a good but not a great story. Much of the blame for this lies in the characterization. Mittlefehldt paints many of his characters with the same brush. All the men in Mike’s church are stern and distant, while the women are meek and submissive. The church minister is a stereotypical hellfire and brimstone preacher. Certain characters are introduced as if they are meant to have some impact on the storyline and then dropped with no significant development. Many of the scenarios presented in It Looks Like This fall prey to cliche and stereotype. Mike’s sexuality is suspect due to his disinterest in sports and his strong artistic talent. The only two characters who defy stereotype and convention are Mike’s sister, Toby, and Mrs. Pilsner, the mother of one of his friends. Finally, the overall undercurrent of gay bashing feels suspect. The reader, who is privy to Mike’s inner thoughts and recounting of the events, is given occasional hints that he is gay, but to the outsider, there would be no reason to suspect, other than the fact that he is not athletic and enjoys art. Readers who enjoyed It Looks Like This might also like Simon Vs. the Homo Sapiens Agenda by Becky Albertalli, Cut Both Ways by Carrie Mesrobian, or The Tragedy Paper by Elizabeth LaBan. Each of these books address issues of bullying, adapting to a new environment, and first loves. Simon Vs. the Homo Sapiens Agenda specifically deals with the issue of cyber-bullying and has a far lighter tone, although both it and It Looks Like This veer toward the predictable. Simon Vs. the Homospiens Agenda never fully addresses the consequences of the characters actions. It Looks Like This goes slightly further yet still does not show the events as having any long term consequences for the perpetrators. In fact, it is Mike and Sean who suffer the greatest consequence from the actions done to them. In contrast to It Looks Like This, Cut Both Ways takes a more serious approach to the issue of bullying and creates more realistic scenarios, placing it somewhere between Simon Vs. the Homo Sapiens Agenda and It Looks Like This in tone. As with Cut Both Ways, The Tragedy Paper treats the issue of bullying with a serious tone. Like Mike, Tim becomes the target of one particular individual who seeks him out with malicious intent. Also like Mike, Tim stands out as different and awkward, though Tim’s differences are primarily physical whereas Mike’s are that he is quiet, introspective, and uncertain of his sexuality. Other similarities between The Tragedy Paper and It Looks Like This include a singular tragic event for which both boys blame themselves and which will shape both their futures. Mike, however, unlike Tim in The Tragedy Paper, has a minor but direct role in the tragic event. Also, while Tim is targeted by Patrick the jealous boyfriend of his crush, no particular reason is given for Mike being targeted by Victor other than a subtle implication of self-directed homophobia. It Looks Like This is enjoyable, although the first half drags somewhat. I found that the pacing increased almost exactly half way through, as I had just reached the point where I was ready to give up when the momentum increased. As such, the second half of the book was stronger and more enjoyable than the first half. In addition, I found the books formatting to be distracting. Mettlefehldt does not use quotation marks to indicate who is speaking, but rather depends on line breaks and “he said” or “she said”. While the “he said” and “she said” is standard usage, the lack of visual indicators for speakers made it difficult in places to differentiate narrative and dialogue. This choice is based on the fact that Mike is retelling events that have already happened, but I felt that it detracted from the story and interfered with my enjoyment of the book. Dumplin’ by Julie Murphy tells the story of Willowdean Dickson, self-proclaimed fat girl. The story opens with Willowdean telling the reader that all the best things in her life have started with a Dolly Parton song. It starts in the summer before first grade with Dumb Blonde from the 1967 debut album “Hello, I’m Dolly.” Willowdean’s Aunt Lucy bonded with Mrs. Dryver over their mutual love of all things Dolly. As the women sipped tea and gossiped in the dining room, Willowdean and Mrs. Dryver’s daughter Ellen sat on the couch watching cartoons. Each uncertain of the other, Dumb Blonde begins playing on Mrs. Dryver’s stereo one day, and before the chorus, Ellen and Willowdean are dancing in circles. So begins the bond that unites them as best friends. Fast forward to the present where Willowdean (called Dumplin’ by her mother) feels as if her life is slowly starting to unravel. Willowdean’s beloved aunt Lucy has recently passed away, her mother a former beauty queen is constantly on her about her weight and seems hell bent on removing all remaining traces of Aunt Lucy from their house. Ellen has taken up company with a new friend who does nothing to hide her contempt of Willowdean, and Bo, the boy she’s had a huge crush on, suddenly seems interested in her as well. Thinly veiled put downs from Ellen’s new friend and furtive, secret, make out sessions with Bo do little to boost her confidence. So, Willowdean sets out to reclaim it by doing the one thing unimaginable to her mother and nearly everyone else. She enters the Miss Teen Blue Bonnet beauty pageant. What at first is meant as an act of defiance towards Willowdean’s mother, soon becomes a protest against societal norms as several other overweight girls enter the contest with her. Dumplin’ is a fine commentary on the societal pressures placed on teens today. Willowdean is an immediately likable character in that she’s a bit sarcastic and sassy, but also in that she is initially happy with herself and her looks. In fact, most of Willowdean’s unhappiness stems from the expectation of others that she should not be secure and confident in her own skin. Her mother, who peaked when she was not much older than Willowdean, continually nitpicks about Willowdeans weight telling her she’d be happier if she was skinny. The only one who seems to understand Willowdean is her Aunt Lucy. Unfortunately, she recently passed away from complications of extreme obesity. Willowdean’s relationship with her mother was already strained at best and has now become outright hostile due to efforts on the part of her mother to clean out Lucy’s bedroom and turn it into a craft room. Bo, the former football star from a local elite private school, seems to enjoy making out with Willowdean behind the dumpster and in the parking lot of an abandoned school, but shows no signs of wanting to go public with their relationship. Upon this realization, Willowdean dumps him rather than stay in a relationship that diminishes her self-confidence. In A 52 Hertz Whale by Bill Sommer and Natalie Tilghman, James is a 14 year old loner with two primary interests: humpback whales (particularly a juvenile named Salt whom he sponsors) and avoiding interaction with his peers as much as possible. When Salt appears to separate from his pod, and James’ only friend gets in with the cool crowd, James looks for advice from the only place he knows, Darren an aspiring filmmaker who once volunteered in James’ class. Darren knows nothing about whales, but after being dumped by the one true love of his life, he has little but time on his hands. Recognizing a kid in need of a listening ear, he fires off a quick reply. This sets off a chain of emails between the two setting them on a course neither could have predicted. 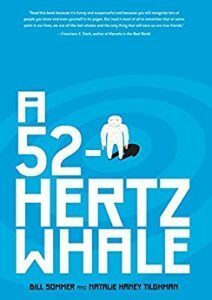 A 52 Hertz Whale portrays the developing friendship between James and Darren with quirky humor but also has a serious side that deflects the humor just enough that neither element is too little or too much. The novel is written entirely in email format, the majority of which are between James and Darren but some also introducing other characters giving the reader insight into their lives and interweaving them with the main characters with subtle finesse. Both Dumplin and A 52 Hertz Whale deal center around characters whose misfit status comes not as much from the fact that they don’t quite fit in anywhere, but more from the fact that it doesn’t bother them as much as it bothers those around them. In the case of Willowdean, it is not her weight that sets her apart so much as the feelings of others about her weight. To her mother, her best friend, and a town obsessed with beauty pageant culture, Willowdean is an outsider because she simply doesn’t care. She is comfortable in her own skin and wishes others could accept her as she is not who they want her to be. Like Willowdean, James doesn’t particularly care that he is different. He admits to missing his friend, but can’t fathom why he should be expected to conform to society. Through his exchanges with Darren he learns a little about being true to one’s self while also being willing to compromise. Darren, through his exchange with James, learns about chasing his dreams and being less afraid to take risks. Both books share a common theme of loneliness, acceptance, and the horrible awkwardness of being a teenager. James and Willowdean both experience a period of learning that asking others to accept you as you are, means being willing to accept them in the same manner. Dumplin’ ties together it’s storyline in a neat and cohesive manner while A 52 Hertz Whale leaves some minor plots dangling. The latter might frustrate readers looking for a clear resolution, but it works within context of the main plot. A 52 Hertz Whale and Dumplin’ are vastly different stylistically and in their settings, but the books compliment each other in such a way that one could imagine a universe in which James and Willowdean might recognize each other as kindred spirits. Calling Me Home by Julie Kibler recalls the relationship between Isabelle McCallister and Dorrie Curtis, her hair dresser. The novel begins with a brief introduction by the main character Isabelle. She confesses that she feels she acted horribly towards Dorrie on their first meeting: her regular hair dresser had quit and Isabelle is not a big fan of change. As the years pass, they form a friendship which on the surface seems unlikely. Isabelle is 89 and white, whereas Dorrie is in her mid-30’s and African American. Although neither woman says it out loud, they come to depend and rely on each other and their bond deepens to that of a mother/daughter relationship. Still, Dorrie is taken aback when Isabelle approaches her and asks Dorrie to drive her from their home in Texas to a funeral in Cincinnati. Isabelle does not initially say who the funeral is for, and Dorrie, in an effort to respect her privacy doesn’t ask. As the two travel, Isabelle begins to recall events from life as a young woman of 16 to the present. Told in alternating perspectives, starting with Isabelle in 1939, the reader discovers alongside Dorrie how Isabelle fell in love with and married Robert Prewitt, the son of her family’s “colored” housemaid. As the story unfolds, Kibler allows the reader to experience Isabelle and Robert’s relationship almost as an intimate participant. We learn of Isabelle’s overbearing mother, her good old boy brothers, and her caring but ineffectual father. Interspersed in this, we also see Dorrie’s reaction and how it impacts her dealings with her own family and romantic relationships. Calling Me Home will draw immediate and obvious comparisons to Kathryn Stockett’s The Help. Both are debut novels which deal with race relations in the United States during the early and mid days of the Civil Rights Movement. In contrast to The Help, which takes place in the 1960’s and surrounds the lives of an extensive group of people, Calling Me Home focuses primarily on Isabelle, Robert, and their immediate families. In addition, The Help touches on the impact people such as Dr. Martin Luther King Jr and Malcom X have on the characters’ lives, whereas Calling Me Home takes place before those figures rose to prominence. Finally, in Calling Me Home, Isabelle is a naive and idealistic woman in love, whereas in The Help, Skeeter views herself as an activist. Calling Me Home drew me in from the beginning and even now, weeks after finishing, has not fully let go. I became so fully immersed in the book that I had to stop in the middle of a shopping trip to find a place where I could sit and finish it. In the end, I felt as if I had been put through an emotional wringer. While the book ends on a positive note, it does not neatly tie up all the loose ends – much like real life. Calling Me Home is likely to prompt considerable discussion among readers. The novel does an excellent job of showing the reader that while society has progressed considerably since 1939, things are still not where they should be in the year 2015. Seeing the characters dealing with concerns such as where their marriage will be legal or clergy who tell them their marriage is an abomination or un-Biblical, drew significant parallels for me in the current struggle for gay rights and marriage equality. In addition, reading this novel in light of the recent events of Ferguson and elsewhere shows the reader how little certain things have changed. Kibler writes with a style that draws the reader deep into the story in a subtle and eloquent manner. I found the story so engrossing that I experienced a certain element of culture shock coming out of the novel. The slow but natural development of Isabelle and Robert’s relationship over the course of many months felt neither rushed nor drawn out. Many moments of their transition from passing acquaintances to newlyweds had me waiting with a sense of anticipation to see what would bring them together and what would be the factor that tore them apart. Isabelle and Robert both read as true to life characters. Robert is cautious where Isabelle is spontaneous, which is in keeping with their respective roles in society. At first I struggled with the idea of Isabelle as the pursuer in her relationship with Robert, but as the book progressed, I began to see how Isabelle would be drawn to Robert’s quiet personality. Both are intellectuals and voracious readers, are misfits within their own families, and have an idealistic desire to change the world in which they live. While Kibler did an excellent job of developing the primary characters of Robert and Isabelle, I did find myself connecting less with Dorrie and some of the secondary characters. Dorrie came off as unnecessarily angry and while Kibler adequately explained that Dorrie had been deeply hurt by her ex-husband and other significant family struggles, I did not feel they warranted her hostility towards society as a whole. I also wanted to understand more of Isabelle’s father. It is clear by his actions that he did not agree with the societal view towards African-Americans. He encourages Robert’s aspirations of becoming a doctor, takes time out of his own schedule as a physician to tutor Robert, and contributes funds in order to ensure Robert’s proper education, but is completely ineffectual when it comes to his own daughter. In contrast, the characterization of Isabelle’s mother was solidly written. The reader came to discover how her lower class background drove her fight for a place in “proper society”, and the lengths to which she would go to keep up her carefully crafted appearances. Calling Me Home is a compelling tale that handles decades of race relations with sensitivity while not shying away from harsher elements. Certain scenarios are predictable and familiar, but Kibler doles out the story in small enough increments to keep the reader hanging until the surprising end.